Green roofs can be effectively used to reduce stormwater runoff from commercial, industrial, and residential buildings. In contrast to traditional asphalt or metal roofing, green roofs absorb, store, and later evapotranspire initial precipitation, thereby acting as a stormwater management system and reducing overall peak flow discharge to a storm sewer system. 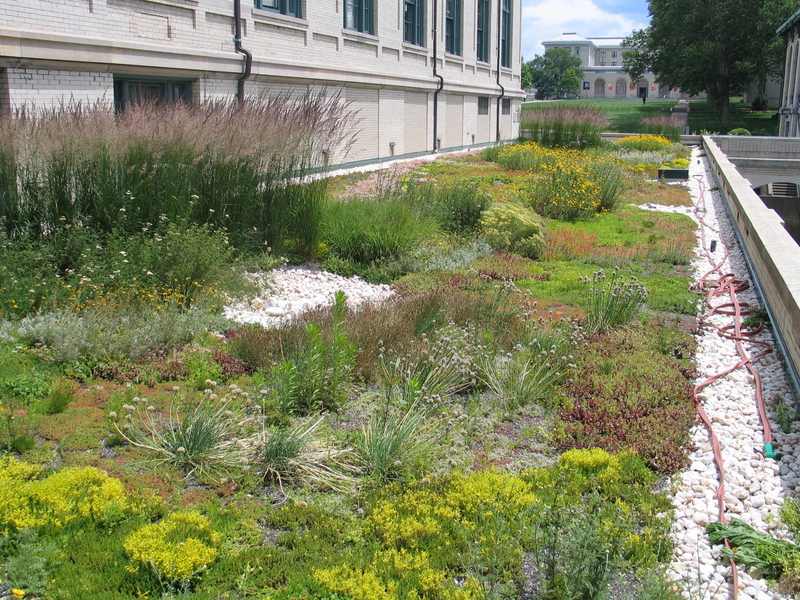 If implemented on a wide scale, Green roofs will reduce the volume of stormwater entering local waterways resulting in less in-stream scouring, lower water temperatures and better water quality. 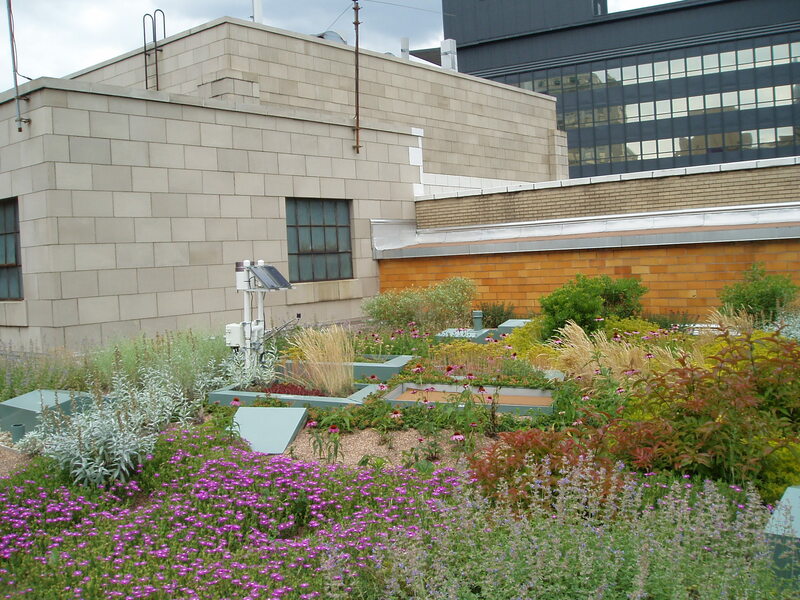 In urban areas with combined sewer systems, Green roofs can reduce the volume of stormwater discharged; CSOs can also be reduced, thus preventing the discharge of millions of gallons of sewage into local waterways. Green roofs are appropriate for industrial and commercial facilities and large residential buildings such as condominiums or apartment complexes. 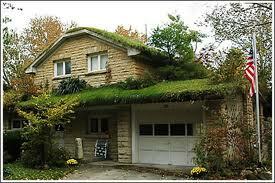 Green roofs can also prove useful for small residential buildings under some circumstances. Single family residential structures, like all buildings with green roofs, must be able to support the loading from a saturated roof. Furthermore, the green roofs should be easily accessible and residents should understand the maintenance requirements necessary to keep the roof functional. Consulting a structural engineer to ensure the roof is designed to accommodate the extra weight of a green roof is the first step in any green roof design. A building must be able to support the loading of green roof materials under fully saturated conditions. These materials include a waterproofing layer, a soil or substrate layer, and a plant layer. Plants selected need to be suited for local climatic conditions and can range from sedums, grasses, and wildflowers on extensive roofs to shrubs and small trees on intensive roofs. Green roofs can be designed to be intensive, semi-intensive, or extensive green roofs. 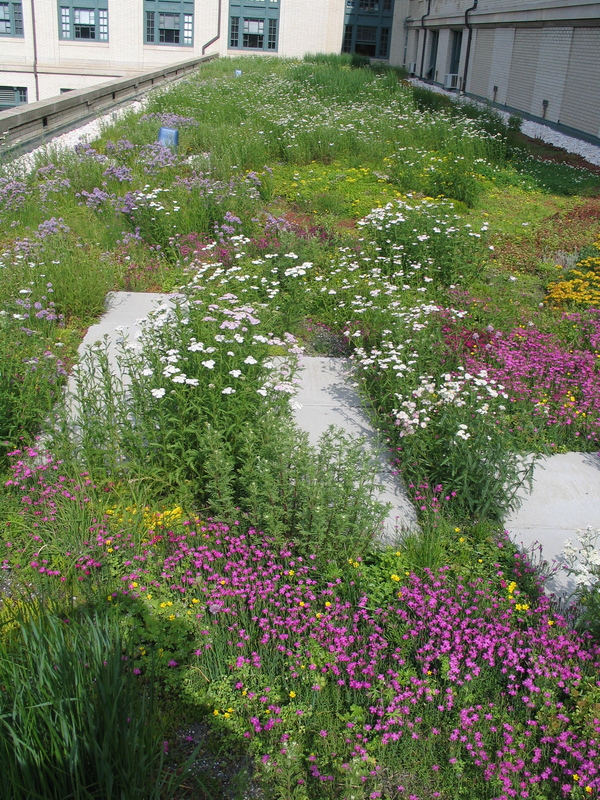 Intensive: Intensive green roofs have greater than six inches of substrate. Intensive green roofs are particularly attractive for developers, property owners, and municipalities, in areas where land prices command a premium, but property owners want to provide some of the amenities associated with parks. Semi-Intensive: Semi-intensive green roofs can be defined as a hybrid between intensive and extensive green roofs, where at least 25 percent of the roof square footage is above or below the six inch threshold. Semi-intensive and intensive green roofs are designed to be used by the public or building tenants as a park or relaxation area. However, they also require greater capital and maintenance investments than extensive green roofs. Extensive: Extensive green roofs have four inches or less of growing medium.Extensive green roofs provide many of the environmental benefits of intensive green roofs, but they are designed to be very low-maintenance and are not typically designed for public access. The type of design chosen will depend upon loading capacity, budget, design goals, and stormwater retention desired. There will also be variations in the type of green roof selected depending upon climate, types of plants chosen, soil layer depth desired and feasibility and other design considerations. Green roofs can be constructed layer by layer, or can be purchased as a system. Some vendors offer modular trays containing the green roof components. Weeding 1st year, periodically, after 1st year occasionally This can involve gardening and irrigation. Fertilization After 1st year, lightly fertilize once a year This can involve gardening and irrigation. Inspection Once a year Green roofs are less prone to leaking than conventional roofs. In most cases, detecting and fixing a leak under a green roof is no more difficult than doing the same for a conventional roof.